Given Oklahoma’s tendency to spawn violent weather, I’ve invested in alert systems to keep current on rapidly changing weather conditions. I figured, “Boom. Yay. Now I’m covered for emergency notifications.” Wrong. Monday morning I received a text message from my Alma Matter, the University of Oklahoma, notifying me of a police pursuit. I wasn’t in Norman at the time, but I had been there just an hour earlier to run an errand. Naturally, I sat up and took notice of the message. I’m not saying that I find every text from OU valuable. Class cancellations don’t effect me anymore. But after the recent spate of mass shootings, one can hardly afford to ignore public safety warnings. This is also a part of being an engaged citizen. As per the social contract you should try to stay informed about what is happening around you, otherwise you may unwittingly put yourself in danger or drain resources for those who truly need them in a time of crisis. Exhibit A. OU’s text alert emergency management system doing its job. Also, “Better safe than sorry,” is another phrase that pops to mind. 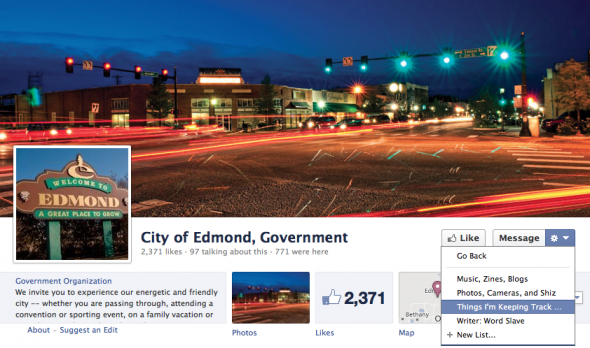 As I watched a flurry of Facebook activity from my friends in Norman evolve, I began to question how well I kept current with the flow of public safety information. At okc.net we don’t keep a TV at the office and we don’t keep up with the 24-hour news cycle. We have our own highly personalized news feeds that we skim. We don’t listen to police scanners, we listen to the music we’re reviewing next. Our main source of information at any given moment is more likely to be social media than any traditional news source. How well do platforms like Facebook and Twitter perform as disseminators of information? Most emergency agencies and city governments have Facebook and Twitter pages, but Facebook now charges page owners a fee to reach all of their followers, and individual Tweets are likely to get lost in the constant flood of information. I remember a recent study on Twitter indicated that over 70% of Tweets went unread. In a state of emergency there’s a good chance a status update will be shared by enough people that a public safety warning may go viral. We were curious if Facebook cuts emergency services a break on their pay per viewer pricing model as Facebook does not adequately answer this question in their help section. It does require that a region or location have an official government body with proper documentation to run a page, but other than that no additional information is provided. In a world where most people are constantly attached to their cell phones and to the Internet, it might be a good idea to consider using social media as a platform for public safety updates. But since the price of sponsored posts on Facebook makes that virtually impossible for cash strapped local governments, citizens will need to consider other options to close the gap if their cities are not paying to promote emergency-related posts. With this in mind, I called the Norman Police Department to ask how the department dealt with social media. My query was directed to Captain Tom Easley who serves as both a division commander, Public Information Officer, and the NPD Facebook Page Administrator. Captain Easley said the NPD does not pay to promote posts. And while they do have the option, that is not something they intend to do anytime soon. He said after Norman’s unusually crazy Monday, which included a manhunt, a bank robbery, and a fatal highway accident, the organic likes (new followers who found their way to the page organically as opposed arriving there through a paid advertisement) had increased by a few hundred. Last I checked the page had 1,905 followers. Easley speculated that yesterday’s events probably generated a state of heightened awareness. When you compare the number of followers for The City of Norman (1,122) and Animal Welfare (752) pages to that of the Norman Police Department, it is apparent that people are interested in getting official updates on current events. One would think the new wave of social media platforms would make the flow of information more streamlined and reliable, but is clear that is not the case. The FCC has mandated for decades that broadcast stations make available their resources to emergency management systems in the event of a crisis, but this is not so with social media platforms. Relying on organic shares and traffic has its perils for public safety. What if the drama of a manhunt goes viral while a missing child gets fewer “likes,” comments, and shares? Consider how public awareness plays into both these situations. Generally the public is not asked to involve itself in a manhunt, but they are asked to be on the look out and report suspects if spotted. In the case of a missing child, however, the first 24 hours are critical and the viral spread of information on social media could potentially save lives. The future of posting information may change dramatically as cities learn to evolve their communication strategies. This will include how to effectively promote posts that may fail to go viral but have dire consequences for an individual and by extension their family and community. All said, the way we connect now and in the future is not likely to take the form of a mandate from government. Rather it is clear to me that input will be needed on each level. Citizens, media organizations, and government agencies will need to, if they haven’t started already, hold on going discussions on how to streamline information distribution. In the meantime, one way citizens can get the most of out of Facebook is to create an “Interest List” for local government channels and add the official Facebook pages of those entities as needed. In this way both citizens and the government agencies that serve them can mitigate the pay-per-view system Facebook uses to generate income. And to be frank, this is a system that nearly borders on censorship. Adding a Facebook Page to an Interest List is easy. You first create a list. This option should be on the same page as your News Feed. It’ll be on left hand side of the page, scroll down. You’ll find it. Next you visit the Facebook page you intend to add, go to the widget icon and pull down the drop down menu. Then add the page to whichever list you deem fit. One last thought on why social media may not be the most reliable way to get information during a public safety crisis. Remember, just because all your friends are posting about a situation as it is happening, you’re only getting up-to-date information from an extremely limited view point. For example, when Norman Public Schools went on lock down, there were a lot status updates made from closets, gyms, and classrooms. That’s great if I want to know who has limited mobility or what the situation might be like for students. But what does it tell me about the state of the overall situation? Not a great deal. It also highlights a problem that Captain Easley touched upon several times in our conversation. Emergency management is about keeping the peace while resolving a crisis. For that reason only a few people are allowed to make statements on behalf of the NPD or the City of Norman. Obviously they want to put out accurate and timely information. But the key is having an official that can be trusted to phrase information in such a way that is clear, does not inadvertently cause mass hysteria, or jeopardize an investigation. This point got me thinking about the responsibility of teachers and school administrators when it comes to keeping the peace. I scrolled through the Facebook updates. On the surface they seemed ok, no identifying details about students were given. But can it contribute to panic? I asked Easley if there were any potential ramifications from status updates about the Norman Public Schools being on lockdown. What I learned was that his office was inundated by calls not only from the media, but freaked out parents as well. The overwhelming volume completely tapped their limited resources. How much of that call volume could have been handled if people had known to check NPD’s Facebook or sign up for e-mail or text alerts once they realized something was going on? This is what I mean when I say this discussion on information management will have to happen on multiple levels. Citizens, media, and the government will need to find a way of disseminating information without causing bottlenecks in the system. The best way to do that is to critically examine the way information flows and identify strategies for improving the system as a whole. One way is to look at how bigger cities have adapted the distribution of information over multiple networks. With the rapid proliferation of technology and a growing population, it makes sense to observe the advantages and shortcoming of real world examples. I’ve come to the conclusion that text and e-mail alert systems from official sources are the most reliable and accurate ways to get information about the whole picture. Will I check Facebook or Twitter? Yeah. But will I rely exclusively on status updates, shares, and likes? No. They’re only fragments of a whole. Additionally I don’t care much for TV stations, which is moot point when the power is out. I don’t believe the current model of broadcast media helps to maintain clear thinking in times of crises either. News channels are in competition with each other to grab viewers by swooping in first. I feel like there’s always an element of sensationalism in their reporting. If they don’t have information to report, then they’ll fill in that air time with unfounded speculation or rope in a witness who may not be any better informed than your friend who is Tweeting about the same house fire they’re covering from the side of the road. At any rate. I looked into the way three cities handle their emergency notification systems. If you don’t live in Moore, Norman, or Oklahoma city, it would benefit you to look up your city and sign-up if the option is available. Also, give your city feedback if you see a weakness in the system. 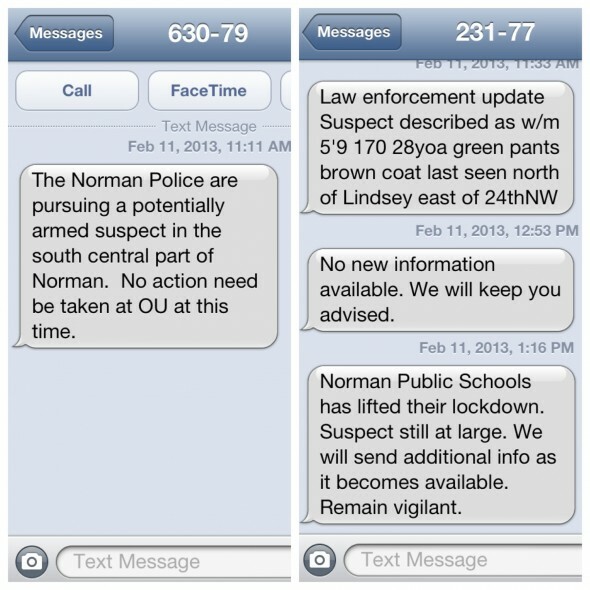 City of Norman makes it really easy to sign up for e-mail and text alerts. Pros: Captain Easley said they don’t send out many text messages. And there maybe a total of 12 e-mail messages in a month. He said the system the City of Norman uses is provided by Nixle, which is a free service. The types of information he sends out are categorized by alerts (for major crises), advisories (for minor crises), and community. Community information is generally distributed through the e-mail option. Cons: It is not easy to navigate to this page. You have to know that is hosted on the Norman Police Department’s webpage not the City of Norman’s main webpage. Other than that it is pretty straightforward. You input your number, e-mail, and/or zipcode. From there the system sends you a text message to finalize your subscription. My only complaint is that there is no FAQ page to give an overview of the service i.e. kinds of updates and frequency. For the City of Moore you will want go to the resources list and select Code Red Registration. Pros: On the City of Moore’s main page under “Resources” one navigates to the Code Red Registration selection. The link takes you to a webpage that briefly describes the service. From there you click another link, which then opens up another tab or window in your browser. The rest is pretty straightforward. I spoke with Moore’s Director of Emergency Management, Gayland Kitch, who said the city does not send out weather notifications. But it does send out notifications about wide scale water outages and service interruptions. Kitch said about 2-3 times a year they send out texts about missing children, these are not children who have run away, but children who are usually very young who have suddenly gone missing. From time to time, there will a location specific text that is targets one area of the city, i.e. if you don’t live there you won’t receive the text. For example when Moore police officers were chasing armed suspects on a stretch of road, the suspects threw a gun. After many hours of searching the police were not able to find it. Concerned that the gun may have ended up in a resident’s yard, especially a resident with young children, they sent out an alert targeting that neighborhood. Cons: I had to call the Director of Emergency Management to figure out the frequency and type of alerts I would recieve if I signed up for the service. They would probably save time for all if they maintained a FAQ about the service they use and the updates they typically issue. 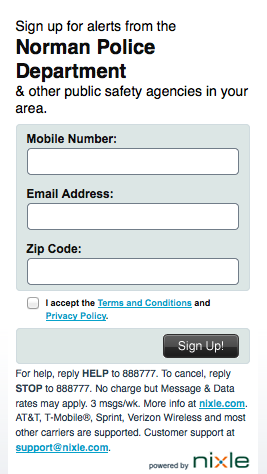 Oklahoma City requires potential users to sign up for a okc.gov account to access their update service. Pros: Oklahoma City does have a FAQ page. And they seem to engage the public more than the webpages of the Moore and Norman. Cons: Signing up for alerts is not that readily accessible. You have to navigate to Public Safety and from there look into the Citizen Alert system. You’ll also have to sign up for okc.gov account. So unlike the services Moore and Norman use, there isn’t a straightforward way to just input your number. Tagged Code Red Registration, community, EDMOND, Facebook, FAQ, Interest List, Moore, norman, Norman Police Department, Norman Public Schools, NPD, OKC, Twitter. Bookmark the permalink.